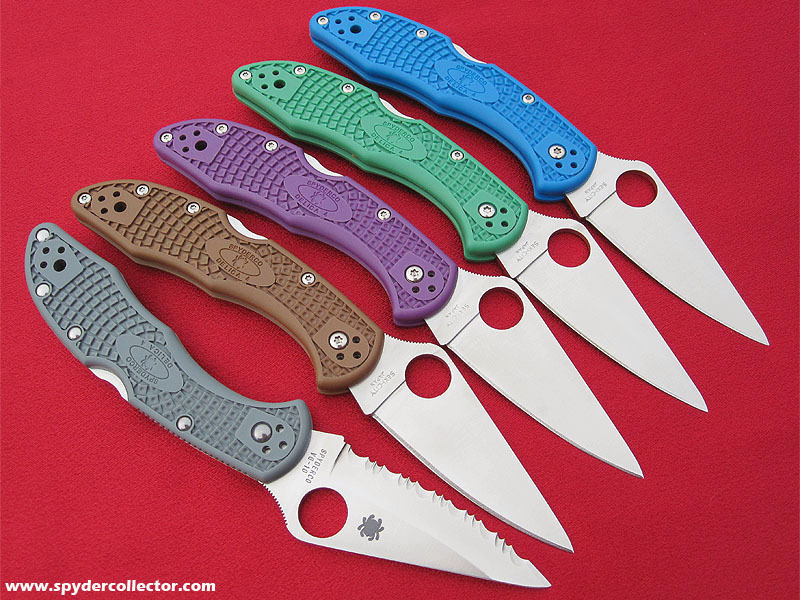 The new colored FRN Delicas with full flat grinds are like cat nip to this Delica collector. I love the new colors, but don’t let them distract you from the performance. The full flat grinds make these FRN folders into high end slicers. It really reminds me of an improved Calypso jr.
Sure, the Calypso jr. evolved into the Caly III which is a fine knife, but during its evolution the Calylpso jr. gained some weight. These new Delicas offer the same or better slicing power and sharpness as the original Calypso jr., but it’s still a lightweight folder. The edge and tip are very sharp, but also very thin. These new colored cutters are not the best choice for those looking for the next ‘tacticool’ folder. I know, the colors were a giveaway. The edge and tip are very sharp, but also very thin. These new colored cutters are not the best choice for those looking for the next ‘tacticool’ folder. I know, the colors were a giveaway. For the disciminating knife user, these colorful Delicas are great refined cutters. 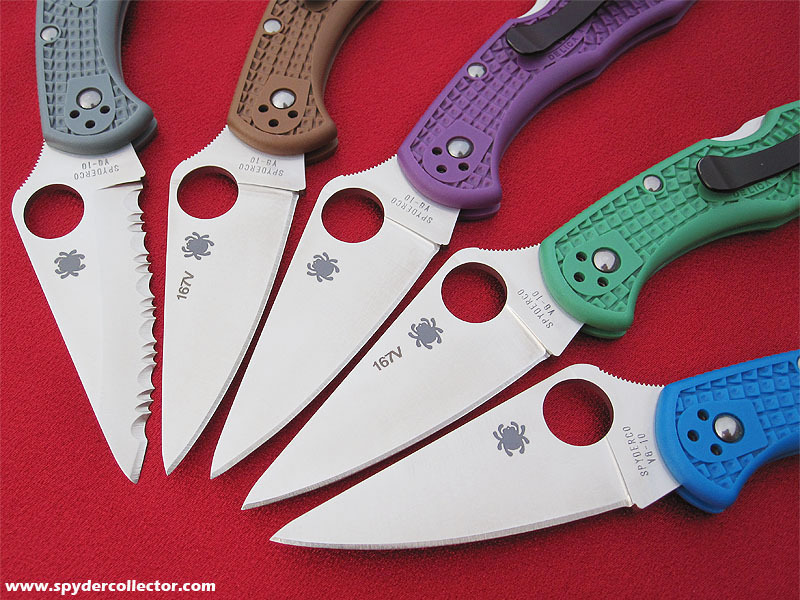 The Delica doesn’t have the image of a high-end knife, rather a tough and great workhorse. These versions are the ferraris among Delicas. I do miss the option of having some teeth in these Delicas, so sacrificed the grey one and swapped that finely flat ground blade with a sabre ground serrated one. The white Delica in this video was never offered with serrations, only a plainedge. This white Delica has seen my ‘surgery table’ before. The stock thickness between both blade is the same, but that full taper and flat grind would have you believe it’s much thinner than it really is. I certainly hope to switch the blade again in this grey Delica in the near future, for a full flat grind SE blade if that ever becomes reality. This entry was posted on Tuesday, April 13th, 2010 at 7:39 pm and is filed under News. You can follow any responses to this entry through the RSS 2.0 feed. You can leave a response, or trackback from your own site. Very cool stuff, loe the new colours but I cant say I am very comfortable not having a choil to choke up on. Must get a brown handled Delica. Sweet! It’s easy to replace a blade! I almost destroyed the blade of my partially serrated Delica ZDP 189 steel at sharpening such extremely hard material. I would like to put a new full serrated blade on my scales, but the Spyderco importers in my country (Spain) say that they don’t sell a blade alone and my local dealer remite me to them. How could I get one? 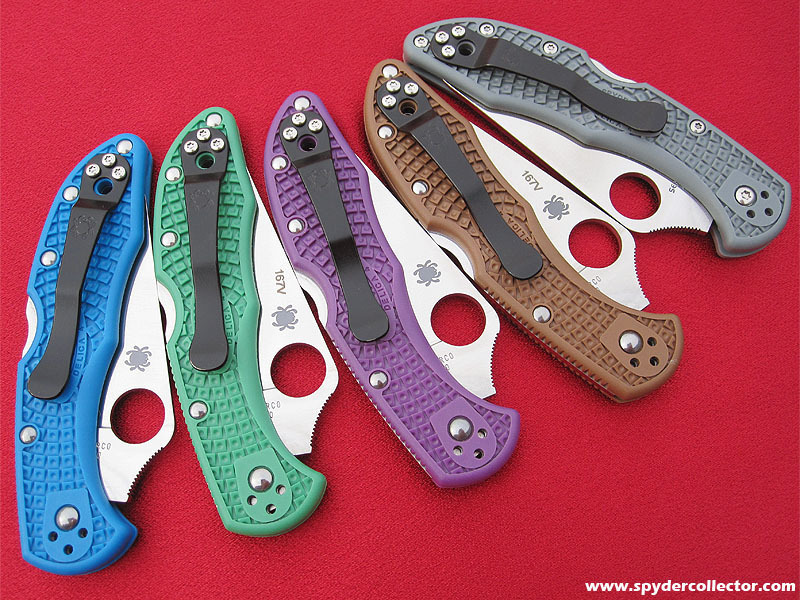 Spyderco doesn’t sell blades, just the parts kit – It’ll be easier to just buy a new Delica. If you shop around on the net you’ll be able to find one that’s affordable. Nice article! btw, I’m situated in the Netherlands and would like to buy a delica FFG. Which online shops do you recommend, because I have no experience buying my knives online. Toolshop.de in Germany was my first online knifeshop, one nice thing about that one is that you don’t have to pay import taxes. Knifecenter and New graham are excellent US based knifeshops that stock a lot of the latest spydies.